It’s February and that means it National Children’s Dental Health Awareness month. This month, the American Dental Association (ADA) holds a month-long national dental health observance. Its goal is to bring together thousands of dedicated professionals, healthcare providers, and educators to promote the benefits of good oral health to children, their caregivers, teachers and many others. Most likely at some point in your child’s development, your dentist will recommend a consultation by an orthodontist. Braces are a rite of passage for many young teenagers. 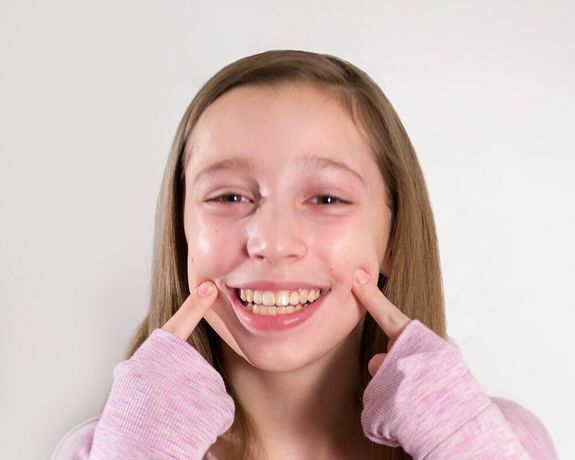 Because orthodontists receive many wonderful questions from parents, I thought it would be helpful to share some of them with you here. The American Association of Orthodontics (AAO) recommends all children be screened by an orthodontist starting at age seven. Most offices offer free consultations, so even a quick evaluation is worth the time. Who should be treating my child: my dentist, an orthodontist, or myself? Orthodontists complete two to three years of additional training after receiving their dental degree. They are experts in the science of moving teeth (yes, there’s a science!) and developing impressive smiles. If your dentist treats children with braces, make sure they have experience and additional training in orthodontics. Mail-order orthodontic treatment is never recommended and can often cause more harm than good. Always make sure a professional is monitoring your child’s orthodontic treatment. I had braces when I turned 12. Why do I see so many kids younger than that in braces? Starting orthodontic treatment while the baby teeth are still in does not necessarily mean your child won’t need full braces as a teen. Early interceptive orthodontics can help correct issues that lead to dental problems in the future. Sometimes starting treatment as an adolescent can actually reduce the time that full braces are required. Your orthodontist can talk to you about whether your child can benefit from any early treatment. Gone are the days of hard metal wires and painful tightening. Wires are now super flexible and comfortable. Many of the materials used were developed by NASA for the space shuttle, and are now used to straighten teeth! Don’t want to wear braces? Clear aligners can also do the job for kids and adults. Do orthodontists still extract teeth before straightening them? Yes and no. In certain situations, extractions are required and can help give you an amazing smile. However, orthodontics has come a long way, and many cases can be treated without removing any teeth. If extractions are needed, your orthodontist can explain why. How long will treatment take and what will it cost? No two smiles are the same, so every child’s treatment will be unique. After a detailed exam, your orthodontist will let you know how long treatment will take and what the cost will include. Some dental plans have orthodontic benefits, so make sure to ask about your coverage at your appointment. We have a very busy schedule; how often do we need to see the orthodontist once we start treatment? Your orthodontist will want to see your child about every four to six weeks. In certain situations, your child may not have to see the orthodontist as frequently, but they will let you know. Talk to your dentist about who they recommend. Talk to your friends or ask questions in your trusted social media groups to see who has had a great experience. Don’t be afraid to get a second opinion; you should feel comfortable with your choice!